How to Recover deleted files on Computer? So it's the end of the work week and you have that 50 page document ready to turn into your boss but OH NO; you deleted it. What to do now? Don't panic, just take a deep breath and read on. Normally files will go to the recycle bin but for the purpose of our lesson, it is gone. Remember to first go into the folder where it was and press CTRL+Z in order to undo the last action. If it still doesn't come back, we need to get into file recovery mode and start working on retrieving the file which is probably still somewhere hidden on your computer. The first thing you will need to do is NOTHING! When you delete a file from your computer, the operating system actually only marks the space that it took on your hard drive as free space rather than deleting it. It is still sitting on your computer but waiting for new files to be saved so it can overwrite the existing data. Every time your computer saves a file or writes data to your hard drive, it makes it harder and harder to recover the file. It is important that you find the best file recovery program to suit your needs. I would suggest going to another computer and downloading one of the following programs. There are many different file recovery programs available for windows. 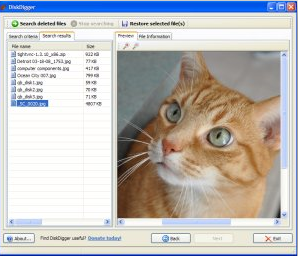 Some of the more famous freeware (software that is designated as free and available for anyone to download and use) available for file recovery include PC Inspector File Recovery, Restoration, Recuva, and Undelete Plus. In my opinion, the two best options are Recuva which has a great GUI and has an awesome rating system to tell you the status of the files available for recovery and Restoration because it turns up a lot more files than the other programs and has the added bonuses of being small and needs no installation and so it can be run from a flash drive. Now that we have decided which tool to download (any of them), copy it to a flash drive and go back to your computer where the file was deleted from. The process to do this varies from program to program, however the methods are all basically the same. Run the program from the flash drive and then choose which drive you want to scan for recoverable files (this will usually be the C: drive on your computer). It is also possible with some programs to select individual folders, in which case you would choose the folder where the file was deleted from (i.e. My Documents). The length of time it takes depends on how fast your computer is, the program you are using and how many deleted files there are on the computer. When the scan has finished, you will get a list of files with strange names. Most of these files are junk that the operating system on your computer created while it was running and you can just bypass all of those. You have to look at the file type (.doc, .jpeg, .mp3 etcetera) and the name of the one you lost. When you find the file you lost, you will need to save it to your computer. This process is the same for almost every recovery program. Either highlight it and press a button that says Restore or Recover or right click and choose where to save it, or drag it out of the window onto your desktop. If you couldn't find your file using these instructions with the program you selected, you may need to choose another program, because unless you buy recovery programs for 40 dollars or up, you will just have to hit and miss sometimes. I would suggest going through the same process with a different program like Stellar Phoenix Data Recovery (Mac) but this only for MAC users which use Mac OS X operating system from Apple Inc. as opposed to most common windows OS from Microsoft, however I have never failed with Restoration. Which Apple Laptop Should I Buy? Is the Apple iPad a Good Laptop Replacement? How to choose the best Laptop? What is the difference between SSD and HDD? Should I buy an Inkjet or a Laser Printer? How to connect a Laptop to an External Monitor? What are the most popular Computer Ports today? How to make your computer run more efficiently or faster? How to create Hard Drive Partitions in Windows? How to Maximize your iPad's Battery Life? Are Rechargeable Batteries better to use?